ISMAPNG is in the early stages of rolling out a massive plan to transition away from fossil fuels through, among other things, the installation of solar panels on a number of its properties. 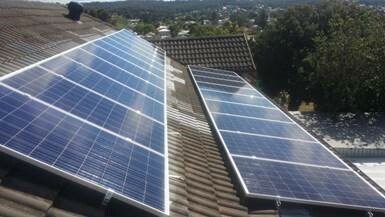 These photos are of one of the first solar installations of the rollout, and were taken at Lockyer Street, Adamstown, NSW. The installation went live on September 15 and ISMAPNG's Environmental Sustainability Project Manager and property team are working with the solar engineers to monitor the performance of the system and ensure that everything works as it should. ISMAPNG's Environmental Sustainability Project Manager and property team, in partnership with BIG Procurement, are now working to identify the group of properties which will benefit from the next phase of the rollout. For more information, email ISMAPNG's Environmental Sustainability Project Manager. One of the first priorities for ISMAPNG's new Environmental Sustainability Project Manager, Chris Hill, is to begin implementation of a major project involving the installation of solar panels on as many ISMAPNG properties as possible. Any properties where solar panels may not be installed due to restrictions or structural building issues such as heritage rules, structural safety concerns, or poor roof alignment to the sun will still be included in an ISMAPNG-wide upgrade of all lighting to LED lighting.